The canard - I've been looking forward to this chapter since day one. A lot people ask, "What's a canard?!" According to wiki, the term "canard" arose from the appearance of the Santos-Dumont 14-bis of 1906, which reminded the French public of a duck (canard is french for duck). Well if that is the case, the Long-EZ is the sexiest duck I have ever seen! 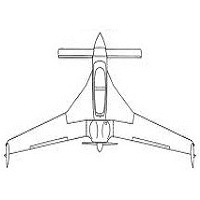 Ok ok, so let's get technical here.. the Long-EZ was originally designed with a GU-5(11)8 canard airfoil (known as the GU canard). To make the long story short - some Long-EZ pilots complained that they did not have enough elevator trim to fly 'hands-off' while flying through rain. In comes John Roncz and designs the R1145MS canard (known as the Roncz canard). In April 1985, a subset of the plans were released - complete with instructions and a set of templates for the Roncz canard - available here: Roncz canard plans. What kind of oscillating tool attachment are you using to cut the glass? Every one I use pulls up the edges. I use the circular cutting tool... looks like a 3 inch diameter wheel. It has a bunch of teeth all around. Its made to cut through metal - like copper pipes or small aluminum brackets.. cuts through cured fiberglass like butter! The trick is to make sure the fiberglass you are cutting is fully wetted out and cured. If its not fully wetted out, you will run into fiberglass strings which will get tangled in the tool.